Ashtar Command Book Blog : Spiritualist High Church? “The Spiritual Magazine” was a Christian Spiritualist magazine published in Britain. This volume contains the issues from 1868. I've skimmed about a third of this material. The magazine strikes me as somewhat curious. It's theologically conservative, but nevertheless believes in Spiritualism. 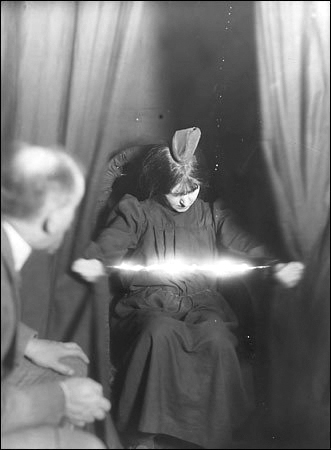 Various paranormal “manifestations” at séances and elsewhere are discussed. D D Home is mentioned in a positive light, and the magazine reprints a letter from Alfred Russell Wallace (who as co-discoverer of evolution through natural selection was anything but conservative, but he did believe in Spiritualism). The editors believe that Spiritualism will strengthen Christianity, and bring agnostics and sceptics back to the fold. Who can deny that the supernatural exist after so many obvious manifestations of the spirit-world? At the same time, “The Spiritual Magazine” vehemently opposes all new revelations superseding the Bible, even if communicated through the mouths of mediums. The editorial board seems to have had a special animus against Andrew Jackson Davis and Thomas Lake Harris. The latter is said to have “out-Swedenborged Swedenborg himself”, and claimed to have channelled the apostles Paul and John, a claim the magazine editors found unacceptable. The conservative streak is also visible in a letter from a reader, asking how spirits at séances can materialize flowers or perfumes. Since creation ex nihilo is out of the question (only God can create out of nothing), the correspondent reaches the conclusion that the spirits have literally stolen the flowers and the perfume bottles from local stores! Thus, these particular spirits are immoral and should not be trusted. Another writer complains about séances where women “magnetize” (hypnotize?) men, which is said to make the men effeminate. Not everyone liked “The Spiritual Magazine”. One competing publication, which claimed to represent Progressive Spiritualism, called the editors “jackals of the lions of priestcraft and ecclesiasticism”. Indeed, Spiritualism was often associated with other dissident movements, such as socialism. I take it that “The Spiritual Magazine” represented the right wing of the spirit-revival. A kind of Spiritualist High Church, perhaps?